The other day, “06880” highlighted an issue that frustrates many Westporters: the limited ways to find out things like proposals for new developments, zoning changes, and upcoming agendas for regulatory boards. The P&Z is on it. A new Planning and Zoning Commission communications subcommittee met last week. On the agenda: how to modernize and improve public notice of P&Z matters. Some neighbors were surprised to learn of a development proposal for the former Daybreak Nursery property. The town will purchase envelopes. Applicants will purchase these from P&Z for a fee, to ensure consistency in delivery of all notices. The mailed notice radius will be expanded beyond the current 250- foot radius of the subject property. 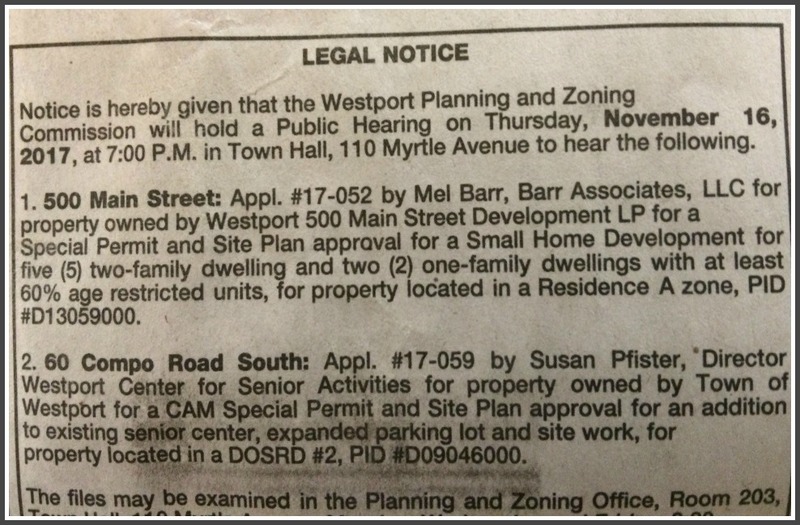 All legal notices to be posted on the Town of Westport’s website at the same time as printed in the Hour, preferably under the headline “Planning & Zoning Notices.” P&Z agendas will be posted 1 week prior to the scheduled meeting. A new “Westport Planning & Zoning Notices” Facebook page will be created, including links to the legal notices posted on the town website. No commenting or messaging will be permitted. 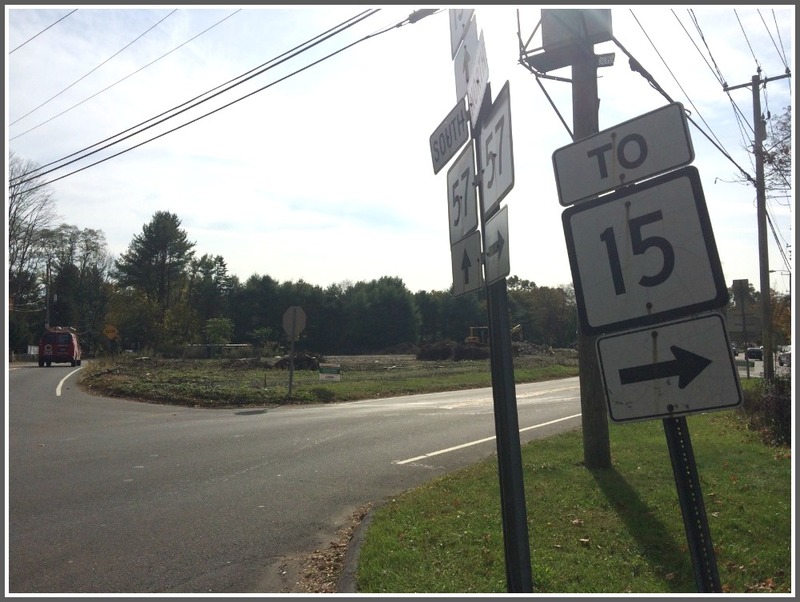 A physical sign (similar to a demolition notice sign) will be posted on the subject property, as proposed by the Coalition for Westport. NOTE: These proposals do not relate to text amendments, which will be discussed at the next meeting. That meeting is next Wednesday (January 17, Town Hall, 7:30 p.m.). They’ll join the RTM’s Planning and Zoning subcommittee to review those ideas, discuss public feedback, and begin improving the process for public notice of text amendments. And … before that meeting, the P&Z subcommittee is asking — very publicly — for feedback. Comments posted to “06880” will be added to the public record. You can also email pandz@westportct.gov — and of course attend the meeting, and speak. “We welcome any and all feedback,” the subcommittee says. This entry was posted in Local politics, Media, Real estate and tagged Norwalk Hour, Westport News, Westport Planning and Zoning Commission, Westport RTM. Bookmark the permalink. Long overdue and should help more people be aware of what is going on in their backyard.Before development is approved the intersection needs to be improved to say the least It is one of the ten worst in the state.I read it in the newspaper which more people should try.Those who toss all their junk mail with their name and address should be aware they are easy prey for dumpster divers and thieves .I have seen them in action at the P.O. Thanks, Dan, for highlighting this issue and for being a conduit for public input! I’ll take the opportunity to reprise comments I’ve made by email to P&Z Commissioners and members of the RTM’s P&Z Committee. — I’m so glad P&Z has taken this issue up so quickly in its new term. I think it’s critical that we all seek to fulfill the spirit and not just the letter of the law in providing effective public notice of important actions by town government. — I hope that whatever actions the P&Z Commission takes (with input from the RTM’s P&Z Committee) can be harmonized with actions to provide better public notice town-wide, understanding that some forms of communications are distinct to P&Z. Solutions implemented by the Commission should make sense for other town bodies as well so we don’t end up with a patchwork of platforms and communications outlets that make it harder for people to be informed rather than easier. Again, I applaud the positive steps thus far and look forward to expanding it to other town communications so we all have the opportunity to be more educated and engaged! Not everyone has or wants a Facebook account. Anything posted on a P & Z Facebook page should also be posted on the Town website at the same time. Information posted on the Town website should be pushed out to those who sign up for notification. These are very positive changes! An example of excellent goverment stepping up to meet citizen needs. Great work. Kudos to P and Z! Thank you for making it easier for all of us to be better informed. Would it be possible to have an online, electronic database where people who receive the orange envelopes can view the paperwork related to the proposed change? I know that some of the documents related to P&Z issues are going to be oversized, but we could purchase a scanner for this if we don’t have them already. According to a notice that I recently received, the only way for me to access the paperwork related to a proposed variance is to visit the town P&Z office between certain hours during the working day. Given that it is 2018, I’m hoping that we can do better!